I got these vouchers and probably not able to utilize them on time! 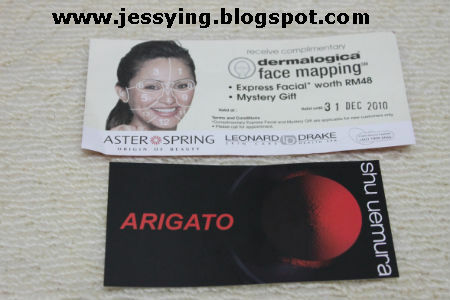 1) Receive a complimentary dermalogical face mapping (skin check) , express facial worth RM48 and mystery gift . Available for new customers only and it's valid until 31 Dec 2010. 2) Shu Uemura eyebrow trimming (15 mins service) from any Shu Uemura outlet. Valid until 11 Sept 2010. Since one of the voucher are expiring next Saturday and to make sure the winner to have ample time to enjoy the service. I will be making this giveaway a simple one. And I will randomly selecting the winner ! And yes you need to be my followers in order to participate in all my giveaway. To be my follower please click follow on the button just below my chatbox. Note : The giveaway will ends at 6 September 2010 , 12pm. And the winner shall be replying my email on the same day by 6 September 2010, 6pm. Or the next winner will be selected. This is to ensure that there is no delay in sending out the prize so that the winner could enjoy the vouchers. This contest is only open to people living in Malaysia only. p/s: There will be more giveaway after this! Hopefully can get the Shu Uemura!